If you have attended one of my classes, then you know how important it is to listen in your relationships. Most people focus so much on what they want to say and their thoughts that very little listening is going on. 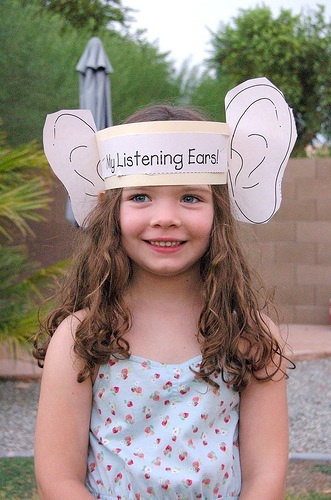 We begin our active listening practice using restating – repeating some of the other person’s words back to them. This helps ensure we are accurately getting the message, and helps move the conversation along. I’d like to take this concept further and introduce Deep Listening. Deep listening is a way to connect with others more deeply than by restating, because it is not focused on the words. With restating we move a great deal of our attention away from out thoughts and onto the words of the other person. The accuracy of your restatement helps measure how well you are able to shift your attention away from your own thoughts while they are speaking. With Deep Listening, the words, while important, are not the main focus. Your focus is on creating an open space for the other person so that you can receive them fully. There is so much information transmitted besides the words. By focusing on everything nonverbal, you can understand so much more about that person, not only the concepts of their thoughts. You learn about their essential nature by paying attention in this way. This kind of attention is rare – it requires your fully attention. Be alert for obstacles to your fully attention: in order to receive them fully you must suspend all judgements about the person. Judgements create resistance and filter out some of the information. This weakens your connection with the other person. You will feel it as an internal resistance to either what is being said, or some aspect of that person that you refuse to accept. You will be creating some distance between you and that person. The amazing thing is that the other person will feel it, too! Humans are so used to being judged by others in lots of small, subtle ways that we have a kind of radar for it. That person will begin to feel judged and a bit uncomfortable, and they in turn may react by becoming more cautious about what they share, or more forceful – trying to reassert their sense of worthiness. All of this action occurs under and around the words of the conversation. Fortunately, the reverse is also true. By fully accepting someone and their experience, even for a short while, we can connect in an open, accepting way. This experience is powerful to both people. It means connecting for both people at a deep level, the level of caring. Caring always affects people for the good because it is healing and it feels great. Begin by becoming present to the current moment (See vol. 1 issue 4). Create a sense of openness and acceptance within yourself. Focus as completely as possible on the other person. Look into their eyes to avoid being distracted by superficial aspects. Notice any judgements about the other person that come up, such as dislikes or concerns, and temporarily let them go. Notice any self-conscious fears that arise and let them go. Remind yourself that it is not only safe to do this, it is actually healthy for both people. Refocus as completely as you can on being with that person for the moment. Allow yourself to experience them fully, to “get” that person. Experience and feel the connection! This type of listening may take some practice to develop. You may be shocked to notice how often judgemental thoughts or feelings come up in your mind when dealing with others. Just notice them when they come up and gently set them aside. Focus on connecting to their essence rather than on any superficial differences. Notice how human they are. Notice how you have felt as they do before, experienced the same or similar emotion, need or drive, or thought. Realize how alike we all are – how connected!